Another measles outbreak was reported in North Dublin earlier this month, marking the fifth officially documented case of the illness in Ireland since the start of February. The HSE confirmed there was an outbreak of measles in North Dublin which was affecting both children and adults. “We have a safe, effective and inexpensive vaccine against a highly contagious disease. A vaccine that has saved almost a million lives every year over the last two decades,” said UNICEF Ireland’s Executive Director Peter Power when talking about the rise of measles. UNICEF stated that there was a 244 per cent growth in measles cases in Ireland from 25 in 2017 to 86 in 2018. 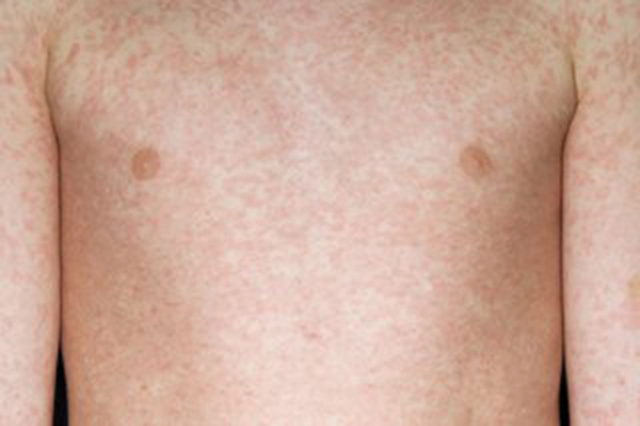 Measles symptoms are similar to the flu such as a runny nose, high temperature, red eyes and a cough. Another sign which is definitely symptomatic is a red rash which looks like several brown and red flat spots joined together, that spreads from the head down the rest of the body. This rash can start a few days after being infected with the illness which can last up to a week. Other symptoms are diarrhoea, vomiting and stomach pain. Measles is more contagious than Ebola, tuberculosis or influenza and once someone is infected there is no specific treatment. However, the Measles, Mumps and Rubella (MMR) is a proven preventative measure to stop the contraction of the illness in the first place. “Measles may be the disease, but, all too often, the real infection is misinformation, mistrust and complacency. We must do more to accurately inform every parent, to help us safely vaccinate every child,” said Power. A vaccine uptake rate of at least 95 per cent with two doses is required to halt endemic transmission of the virus and consequently eliminate measles, according to the HSE. A second dose of the MMR vaccine is then needed when children are in junior infants at school. Also, any adult under 40 years of age that never contracted measles or was vaccinated against it should go to their GP. Those older than 40 are at less of a risk of contracting the illness, however, they are also urged to see their GP if they have not been fully vaccinated and have yet to catch the illness. As measles becomes a worldwide epidemic, various anti-vaccination groups have also become more vocal in recent years. In 2019, the World Health Organisation World Health Organization called the anti-vaccination movement a top 10 health threat. This was prompted after measles cases across the globe rose by 30 per cent. This includes countries where the virus was eliminated at one point. Social media contributes to the anti-vax movement as there were various ads on Facebook on misleading information on vaccines. One of the major myths which anti-vax people use when debating the benefits of not vaccinating children is the link between vaccinations and autism, especially with the MMR. This theory has been widely debunked by medical professionals. Italy is taking extreme action to stop the spread of measles by banning non-vaccinated children from attending school and requiring them to show proof of being vaccinated. Parents can be fined up to €500 for sending their unvaccinated child to an Italian school. Officials say vaccination rates have improved since this measure was introduced.